LISTERINE® Total Care are advanced products that provide a range of benefits for your patients, comprising four consumer products. LISTERINE® Smart Rinse is our product specifically designed for children. LISTERINE® has a wealth of data available, the basic formulation having been available for many years; and our advanced products have been specially formulated to deliver specific benefits. Read more here. 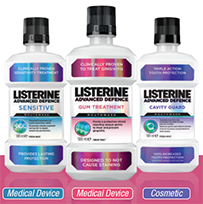 LISTERINE® has been available for decades, the original formulation having been available throughout the 1900s, and therefore there is a substantial evidence base for its use. LISTERINE® has been the focus of much clinical research; with more than thirty long-term studies having been conducted over the last forty years.